KULTIVATOR is a Swedish band as unique as unclassifiable. This was formed in 1978 by the nucleus of TUNNELBANAN (Stefan Carlsson, Johan Svärd and Johan Hedrén), symphonic prog rock band highly influenced by YES and GENESIS, the guitarist Jonas Linge whose playing is reminiscent of Phil Miller and the soprano Ingemo Rylander. The band split just after the release of their first and unique album, due to the apparition of Punk-Rock and New-wave that appealed more to people at that time. The LP named "Barndomens Stigar" recorded in 1981 was reedited on CD by the APM label in 1992. On that occasion, the band reformed in order to release two bonus tracks. Today, the members of KULTIVATOR follow various artistic solo careers (music, theater and teaching). KULTIVATOR's music : a vast field of investigations ! It seems impossible in a first approximation to classify them in a musical category rather than in another. Indeed, the facets of their music are so numerous, and one can notice the same about their influences, and their originality taken from their folkloric Swedish roots. The band itself recognized the following influences : MAGMA, KING CRIMSON, HATFIELD & THE NORTH, HENRY COW, ART BEARS, GENTLE GIANT, ART ZOYD and UNIVERS ZERO. A true hybrid to sum up that blends influences from Zeuhl, Art Rock, Canterbury, RIO and symphonic prog rock. Some famous "journalistic shortcuts" place them halfway between Zeuhl and Canterbury ('Halfway between heaven and earth' sang Richard Sinclair...). Reality, in the light of their music and their influences, is much more complex and it needs a better definition of what Zeuhl is; much more than what commonly defines it on the base of powerful, hypnotic and repetitive themes, achieved by the rhythm section and the piano or on the base of incantatory chants with melodies at times dissonant but above all simple in terms of harmony. So ? The question is not "To be Zeuhl or not to be". 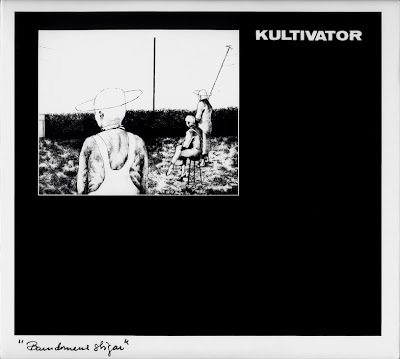 The answer would have been given by the following albums once KULTIVATOR would have found its musical maturity and would have gone farther than its original influences. Anyway, "Barndomens Sigar" is a must-have for any prog lover."